Dear children, a good story for you all to learn. This is a story about a clever monkey which acts smartly at the need of the hour and saves his life. Yes, this is the story of the monkey and the crocodile from the tales of Panchatantra. Once upon a time, there lived a monkey on a mango tree in a forest. The tree was beside a river and the forest was full of trees which had delicious, juicy fruits round the year. The monkey was jumping from one tree to the other, eating the juicy fruits and was living happily. A crocodile was living on the other side of the river. Once he came to this bank and was sitting under the mango tree on which the monkey lived. 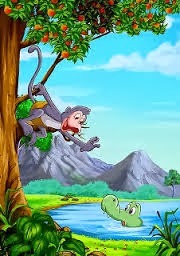 The monkey who happen to sit on the tree, saw the crocodile and offered him some fruits. The crocodile was happy for the hospitality, thanked the monkey and went back to his home. The crocodile started coming to this forest daily and had the fruits offered by the monkey. Soon the two became close friends and they were spending time together in the forest, playing and discussing on various topics. The crocodile wanted to take the sweet juicy mangoes to his wife and asked the monkey for the same. The monkey happily offered him the fruits. The crocodile took the fruits and gave these to his wife who felt very happy on eating the delicious juicy fruits. A wicked thought came in her mind and she told her husband, "dear, the fruits are really delicious. The monkey who is eating such delicious fruits, must be having a delicious heart. So, how about having the heart of the monkey for a delicious meal?" The crocodile was shocked for the wicked thought of his wife and he replied, "dear, the monkey is my close friend. And it is not fair on my part to harm my friend. Please give up your wicked thought." But the crocodile's wife was adamant and wanted the monkey's heart at any cost. Now the crocodile was in a confused state of mind and he has to lose either his dear wife or his dear friend. As there was no other option left with him than to pacify his wife and he could not lose his wife, he thought of getting the monkey's heart for his wife. The crocodile thought of a plan for getting the heart of monkey. The next day as usual when both the friends met, the crocodile said, "hey friend! my wife asked me to invite you for a dinner at our home. So, why don't you come with me now for a dinner?" The monkey was pleased with his friend's kind invitation and said, "I'm willing to go to your house but you know, I cannot swim across the river". "Don't worry", said the crocodile. "It's easy. Just sit on my back while I swim across and we can reach our home". Both the friends started to swim across the water. While they were in the mid of the river, the crocodile started sinking in the water and thus kill the monkey by drowning him in the water. The monkey was scared and starting jumping. He asked the crocodile why he is sinking in the water.The crocodile thought it is time to tell the truth to his friend. He giggled and said, "dear friend, my wife wanted to eat your heart which she thought would be as sweet as the delicious fruits. So, I am taking you home to fulfill my wife's desire". The monkey was shocked at the words of his close friend and his ill-intention. The monkey stayed cool and quickly thought of a plan in its mind. After a while, the monkey said, "oh! dear friend, why didn't you tell me about this before we started our journey? Friend, for my own safety, I keep my heart in the hole of the tree on which I live. If you would have told me before we started, I would have brought my heart to offer your wife. No problem, let's go back and get it for your dear wife." said the monkey. The silly crocodile believed those words and quickly swam back thinking that the monkey would get his heart. On reaching the bank, the monkey quickly jumped down and climbed up the tree. He laughed at the brainless crocodile and said, "my dear friend, how could you think of deceiving your close friend. I too played a trick with you. Can anyone stay alive without their heart?" The crocodile bent down his head with shame and slowly swam across the river never to get back to the forest. Moral: Think and act smart in dangerous situations of your life. Click to read more tales from Panchatantra.